The icon of Saint Matrona, located in Moscow, Pokrovsky Stavropigialny female monastery. It is located almost in the center of Moscow, near the metro stations "Taganskaya", "Marxist", "proletarian", "Lenin Square", "Krest'yanskaya Zastava". 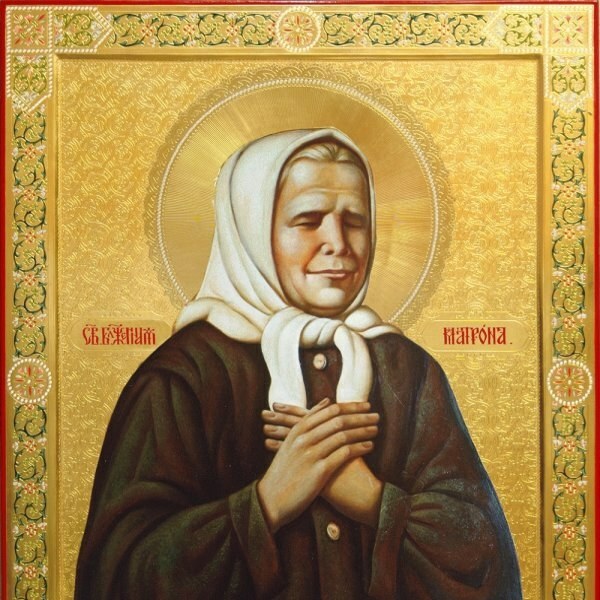 Icons of St. Matrona of Moscow is in many churches. Its revered not only in the capital but also in Russia and in the world. But the main icon and the relics are here, in a convent on Taganskaya street. Pokrovsky Stavropigialny women's monastery is located at the address: Moscow, Taganskaya street, house 58. Nearby are several metro stations: "Taganskaya", "Marxist", "proletarian", "Peasant Outpost" and "Lenin Square". It is best to get from "Marxist", it is the closest of all. If you decide to get to the temple of the Holy mother Matron through the station "Marxist", look for the exit from the subway to the Taganskaya street. It is located at the end of the hall. Climb up the escalator. Turn left and go outside - there is a bus stop. On any transport (minibus, bus, trolley), passing two stops. The monastery is located on the second from the subway. Find it very easy. Transport stops right in front of the gate of the monastery. Can be reached from the metro station "Marxist" and on foot. To do this, coming out of the subway, you need to go straight in the direction of motion of vehicles. Street Tagansky, to its intersection with Bolshaya andronevskaya. It only takes seven to ten minutes. The monastery and the Church of the Holy mother Matrona, with its icon located on the right. From metro station "Taganskaya" to get to the temple you can also. Only beforehand it is necessary to cross the road in the direction of the shopping center "Zvezdochka" - it is visible from the metro. To get to the Pokrovsky monastery, arriving at the metro station "proletarian", you will have to go to the Abelmanovskaya street and follow it all straight, ten to fifteen minutes. Nice guideline - tram tracks, which run parallel. If a long walk is not included in the plans, you can take the tram and get off at the stop "Abelmanovskaya Zastava. Pokrovsky monastery is located across the street from a stop, its red wall will be perfectly visible. From the metro station "Krestyanskaya Zastava" is similarly accessible, it is located very near the "Proletarian". From metro station "Lenin Square" to the Pokrovsky monastery have to take the tram, which follows in the direction of the Abelmanovskaya Zastava. To get to the stop, get out of the last subway car, next to the center, and go upstairs. At the crossing turn left. Then left again, before the transition to the station "Rimskaya". Then the stairs to go outside to find a traffic light and a large intersection. Go to the opposite side, there is a tram stop. You can take any tram, they all go in the direction of the Abelmanovskaya Zastava. Stop is the second from the metro station "Lenin Square". You can walk, laid in parallel to the tram tracks. The road will take ten to fifteen minutes.